What It’s About: Bernie the Agent (Dom DeLuise) persuades Kermit the Frog to leave the swamp and travel to Hollywood to find fame and fortune. Thus begins a long road trip in which Kermit is joined by new friends, meets strange people, and is pursued by frog leg franchise king Doc Hopper (Charles Durning). Why Watch it Today? : Jim Henson, the creator of the Muppets, died tragically today in 1990. 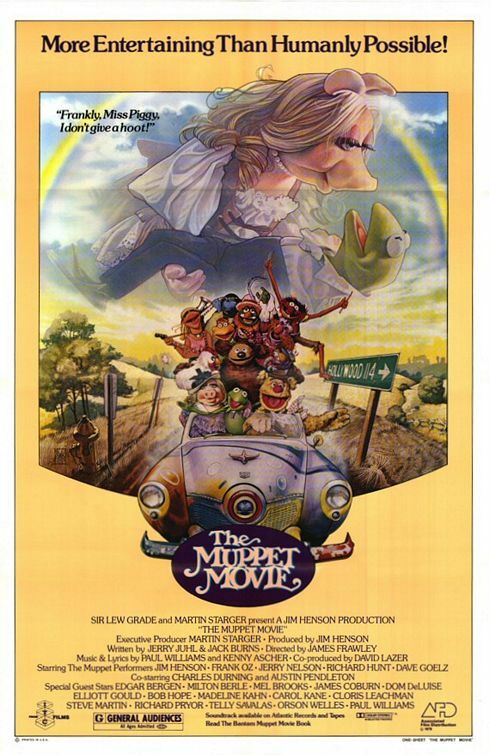 The Muppet Movie was Henson’s first, and best, feature film, featuring the Muppet characters and tons of cameos, anchored by a sweet story and songs like The Rainbow Connection. This entry was posted in Based on a TV Show, Buddy Flick, Comedy, Family, Independent, Movie of the Day, Musical, Prequel, Road Trip, Slapstick and tagged Austin Pendelton, Best Original Score Nominee, Best Song Nominee, Bob Hope, Carol Kane, Charles Durning, Cloris Leachman, Dom DeLuise, Edgar Bergen, Elliot Gould, Frank Oz, ITC Films, James Coburn, Jim Henson, Madeline Kahn, Mel Brooks, Milton Berle, Orson Welles, Paul Williams, Richard Pryor, scientists, Steve Martin, Telly Savalas. Apparently, a video tape exists of my five year old self doing a cover of The Rainbow Connection. I can never run for office. It’s my favorite Muppet film, and the only one I can still stand, though Miss Piggy’s song haunts my nightmares to this day. My sister has a tape of me singing my theme song for the superhero I made up when I was four or five, Fire Devil, a demon that escapes from hell on Halloween night to curse bad guys, so I’m in the same boat. It’s easily the best Muppet film, and the only one I’d want to watch, either. I don’t recall Miss Piggy’s song though! First movie I saw in the theater. I think I first saw it on TV. It’s actually possible that today’s Movie of the Day was the first one I saw in the theater-my Uncle took me to see it when it was reissued, which happened in 1978, 1979, 1981 and 1982. Then again, Empire was also released in 1980, and I know I saw that in the theater, so it’s an either/or kind of thing. Strangely, I remember seeing Flash Gordon better than either of them.